So glad to work with BellaBox this month! Thank you Bella Box for sending some love over! I am really excited to share what is in this August beauty box to y'all!!!! "Laneige's bestselling ultra-hydrating essence that thoroughly soaks the skin with intensive hydration for instant 24-hour smoother and suppler skin"
"A natural whitening cream that works to significantly brighten underarm and inner thigh for skin clarity and tone"
Hmmm... Never heard of this before so it is my first time trying out. I can't give a proper review about it because I only used it for 4 days (don't really see that much difference) maybe I have to use it for few months then I can see the difference? Anyway spots I've tried on (My armpit and knee cap) HAHAHAHAHA so if you've tried it on various part and it works for you... please leave a comment below because I would love to purchase the full bottle! "Consisting of a Purifying Toner, Daily Defense Serum and CC Cream, this powerful trio starter kit is your kick-starter to snowy white, dewy bright skin. Boasting a potent W.H.I.T.E Complex in an exclusive 5 benefits in one botanical formulation, each product works together to Whiten, Hydrate, Illuminate, Tighten and increase skin Elasticity." "A SPF30 Broad-spectrum sunscreen that keeps your skin comfortably shielded from harmful UVA and UVB rays, this day lotion leaves an invisible, featherweight matte finish." Honestly, this is my first time knowing this brand (probably still living in the cave) hahaha and I tried this sunscreen just for a day... I would say that it is very light weight, oil free and no fragrance at all!!! Which I really love it! It gives an overall matte finish look! FYI.. it does not contain (Oxybenzone, mineral oil, petrolatum, synthetic fragrance, phthalates, colourants, formal dehydereleasing, preservatives or parabens) I personally think this is a good sunscreen so far though the brand I really never heard of, you can consider giving it a try! "A revitalising and hydrating duo that moisturises and soothes with organic aloe vera, then gently cleanses and rejuvenates with organic citrus"
"A bold black crayon eyeliner that imparts a soft, creamy texture - it glides on your lids for a highly pigmented finish"
Hmm... I am not into "smudge eyeliner" lately, this really glides on smoothly on my eyes for the first try. Sorry to say again, it didn't last for a day especially when I had oily eyelids.. another disappointment BUT! Sleek eyeshadow palette is highly pigmented and recommended, so don't get fully disappointed by the brand because I had two of it!!! MAD LOVE. "An uplifting body lotion and body wash duo that smoothes and rejuvenates with its natural aromatherapeutic and nourishing benefits"
"Carefully crafted by the brand's very own tea masters, each premium tea blend is concocted with a brilliant mix of ingredients for a glorious sensory experience. 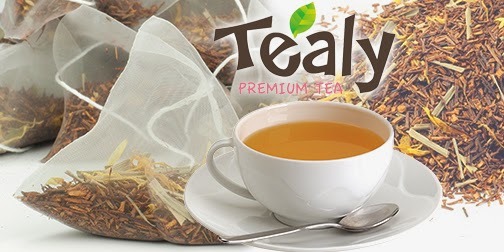 Contains 20 tea bags in a box"
Brought this to work and overall this is a good refreshing tea! Not many comments so far! Finally, I am done reviewing August Bella Beauty Box!! Grab yours already?!?!? If no, feel free to sign up their monthly membership that only cost you $19.95... I mean hey? Monthly surprises.. so why not! The good thing about Bella Box is they PROVIDE FREE DELIVERY.